Admittedly, when I first met Bill Gough, my reaction was that this stooped 6-foot-2, 87-year-old man would offer not much more than a quick introduction to the Foundation he helped form in 1980 — and its recent posting of Challenger explosion-related material on the Web — then I would be on my way. I had just gotten off the plane from Minneapolis and was enjoying the warm air outside a Los Altos coffee shop in a sleeveless shirt. Bill arrived in a long-sleeved shirt with windbreaker. He is the age of my father, who is suffering from dementia and having trouble threading the line of who he has been. The “ism” of age popped instinctively into mind for me when Bill appeared. In a way, that 7/8 experience is why I was in California, learning what others had been absorbing for decades. The very interesting stories we tend to leave unspoken are, indeed, the best part. Bill Gough and three others formed the Foundation for Mind-Being Research as a way to simply have conversations about mysteries that interested them. It started with 20 people. Now there are at least 100 members, monthly learning from a diverse collection of experts about topics that have ranged from lucid dreaming to remote viewing, healing energies to psychokinesis, near-death to afterlife communication, out-of-body experiences to psychic abilities. Bill was always curious and open-minded. That’s part of a distinction I’m seeing in those I have been sitting down with over the past few years. An instinctive openness, rather than defensiveness — a willingness to look into the box, not close the lid. After his postgraduate work in electrical engineering at Princeton — where he saw Albert Einstein walking around without socks and learned what Robert Oppenheimer was doing on hydrogen research — he worked in nuclear fusion power. His last position was at the Stanford Linear Accelerator Center in high energy physics and synchrotron radiation research. (I don’t know what that means either, but he was in deep science.) He began to meet others — two quantum physicists, a mathematician — who were independently coming to the conclusion that science was only grasping a piece of the whole. They came together to begin exploring anything that didn’t make logical sense. Bill himself has experienced everything from levitation of a table he was pressing down on, after personally checking it out himself as a trained engineer before anyone else was in the room.He’s spent time as a shaman’s apprentice, and took an out-of-body trip to the Nazca lines in Peru. Here he uncomfortably interacted with an entity he describes as a being from another time and place. Bill next physically visited Peru, walked the desert site, and observed it from a small plane. This confirmed what he had seen remotely. He witnessed a spoon-bending demonstration alongside his wife and son. They all learned how to bend stainless steel objects through intention. Later his 13-year-old caused an explosion in the living room while experimenting with the concept of adjusting the molecules of structure of a brittle material. A remote viewing experience gave him the mirror image of an actual space he visited later. I agree, right alongside you — these are crazy concepts. Bill, too, after a lifetime of exploration, has no answers. He does not pretend to know, for example, how people he’s come to trust have communicated with the Challenger astronauts since their death in water after the spaceship exploded. He’s been around long enough to know that there are many classical scientific concepts we once dismissed as poppycock that are now accepted as true. Such as when “we believed the brain was a non-changeable system” and the benefits of meditation were made up. Now there is scientific data that proves neuroplasticity is real, and evidence that meditation works with victims of trauma, among others. The Dalai Lama has taken a particular interest into marrying the long-time Eastern philosophy of meditative practice with Western neuroscience research. For a few years I have been talking with largely scientifically trained minds to understand how they got engaged with “hippy-dippy” concepts. Such as the Alzheimer’s researcher who found a breakthrough because of lucid dreaming. The cancer pathologist who attends “woo-woo” conferences to remind us that we are not nearly as structured in our own bodies as we assume we are. The quantum physicist who became a transcendental meditation center director. The anesthesiologist who created a conference about consciousness, where David Chalmers first named the “hard problem”: Where does our ‘thought’ come from and get stored? And then there are the non-scientists I have gotten to know personally. The man who uncomfortably acknowledged the oddity of feeling that his family member had passed through him, learning later that she had unexpectedly died at that time. The synchronistic experience of a man whose young wife had died of cancer, eventually visiting her favorite place in the woods where a leaf had literally fallen into his hand, then returning home to find that a book she had ordered about life and death for a Sunday school class had finally arrived from back order: The Fall of Freddie the Leaf. I myself became interested in ‘what we don’t know yet’ after several precognition events, such as waking in New York City at 6am on 9/11/01 from a rare nightmare, that thin dark men were walking through an alley with the intent to kill (later learning that was the time terrorists were boarding planes in Boston). Or in 2007, when I drove under a bridge in Minneapolis and was hit by the uncharacteristic thought of how terrible it would be if a bridge collapsed; three days later that very same bridge did collapse. I’ve also had several dreams that felt like communication events that have proven interesting. One Cambridge-taught biologist, Rupert Sheldrake, has made it a practice to research animals and people with unusual abilities, such as telepathy: from the parrot who could speak out loud images its owner in another room was seeing, to dogs that know when their owners are coming home, to the sense of being stared at, and the ability to know who is on the other end of the line before picking up the telephone (in the days before caller ID). 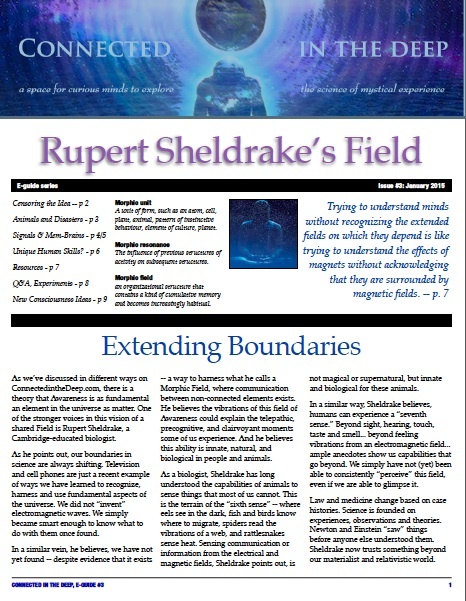 He has encountered so many individuals with experiences that he says are not “paranormal” but “normal” that he has become one of the strongest voices — and subjects of attacks — suggesting that science’s dogmatic belief that the universe consists only of matter, not consciousness, has got to give way to a less materialistic focus of study. 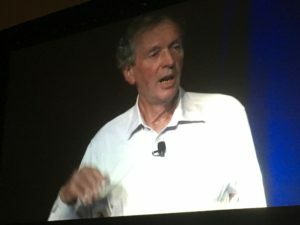 He sees a transformation in the sciences around consciousness is coming, partly because the numbers of those who dismiss it as poppycock are becoming outnumbered. 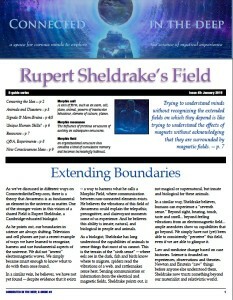 When taboo topics begin to be lifted, and research grants begin to be awarded to explore mysteries about consciousness, Sheldrake and the thousands of people who attend conferences hosted by IONS, Science and Non-Duality and others are optimistic that meditation isn’t the only way we’ll begin to benefit. Personally, I am beginning to call it a recognition of “resonance” as a force that goes even beyond intuition or being “in the zone.” I gave a Spotlight Talk at the IONS conference about why I think we’re at a time when receptivity to this long-simmering consciousness conversation is opening up — and how, and why, we might begin to “come out of the closet” about formerly taboo topics. It’s what tends to bring me into conversation with people like Bill Gough — that curiosity to ask questions. When Bill Gough and his FMBR colleagues received transcripts of conversations a Michigan-based medium had apparently been having for a few months since the Challenger exploded on January 28, 1986, he was skeptical. The channeler had been an actress; as with other claims of communication after death, it seemed like it might be a mental creation of the channeler. He looked into it with an open mind, he said, after one of the mediums conveyed a message to Edie, one of his colleagues, whose neighbor had died recently. There were certain secret papers hidden in the house of the deceased that she asked relatives to find. And they did, tucked away where the deceased indicated they would be. The channeler did not know Edie, or her deceased neighbor. How would she have known where to find hidden documents? His original scientific expectation was that an energy field might remain after death, and then dissipate. But what he learned from witnessing the two mediums, who had involved conversations with the entire Challenger crew over long periods of time, is that it did not dissipate. The message of the astronauts themselves seemed to be that life did continue in some fashion after death, with abilities no more omnipotent and cognition no more transcendent — and likely some filtering through the medium that impacted the storytelling — but he became convinced that it was valid. As a long-time communicator, and collector of stories, I realize that every article I’ve ever written about someone is the interpretation my brain makes about the nugget of their story. And even their story is only a snapshot of a lifetime of experiences, contradictory thoughts, changes of mind. It’s as if — in the quantum physics-speak I’ve been absorbing for a few years — our brains collapse the wave function into a particle … a groove … a bias … a decision that can just as easily be different in another moment, after a new conversation. We co-create and transform storylines all the time. And in this day of proliferating storytelling online, we find other viewpoints that agree with our own — and thus become more polarized about human-made Us vs. Them categories and fragmentations that we make for ourselves but that don’t actually exist beyond our own brain matter. “The map is not the thing” — the phrase of a mathematician — attempts to remind us that what we depict is not a law. Consistently, in science and other fields, our sense of “the story” changes as new variables come to light. And those variables arise only when we’re curious enough to ask questions and follow new lines of thought. The co-creation of our universe comes from participating in a dynamic, interactive flow of information that inevitably influences whatever it intersects with. Think of any conversation you’ve ever had that caused your life to move into a particular direction — I call them pivot points. But it’s also as simple as the moment you smile at a stranger instead of scowling. Everything we do intersects with others. And that kind of participatory universe is what many of us are exploring — what are we building, day by day, and can we tweak it with these minds we are so fond of? 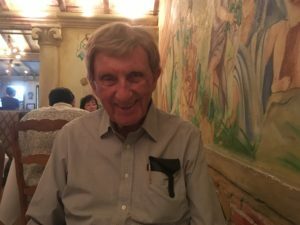 During a dinner conversation with Bill Gough, my host — remote viewing expert Jon Knowles — asked Bill if he thought activism, of which he has been part, is the “answer” to the current political crisis as compared to creating a more positive collective energy. Entanglement is proven scientifically he said — Einstein’s “spooky action at a distance.” We cannot explain it, and thus many scientists won’t accept it. Just as “most physicists haven’t accepted there is a human consciousness effect” on the way the universe operates. This is a wonderful article, Mikki. We will send it out to our members, who, I’m sure, will enjoy it as much as I did. Thank you for your writing and for your willingness to explore, to build community and to communicate so beautifully about our interconnectedness. Truly, the awareness of our interconnectedness on all levels will transform our societies and our relationship with the planet. We welcome you to an FMBR meeting if you are ever back in the area. It’s always nice to connect with like-minded folks!